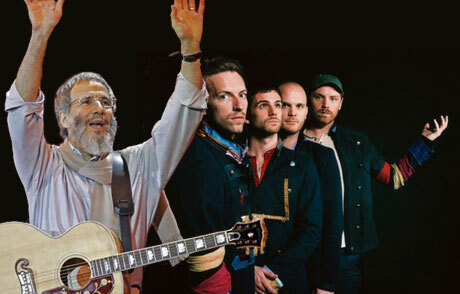 As previously reported, Yusuf Islam (formerly known as Cat Stevens) has accused British pop-rockin' sensations Coldplay of ripping off his material. But Islam has now decided to make peace with the band over some tea, rather than sue like Joe Satriani. Islam previously stated that Coldplay's "Viva La Vida" sounds much like his 1973 tune "Foreigner Suite." In an interview with Reuters, Islam said: "The song definitely sounds like it... It has such logical chords and the melody has to be what it is." Islam also insinuated that he would sue Coldplay, but would first wait and see how well Satriani does in court before pursuing his own lawsuit. However, Islam now wants to bury the hatchet with the Grammy Award winners and told the Daily Express [via TwentyFourBit] that he wouldn't be following Satriani's lead. "I stand by what I said. They did copy my song but I don't think they did it on purpose," Islam said. "I have even copied myself without even knowing I have done it. I'll write down what I think is a good melody and realise it's the same as something I have already done...I don't want them to think I am angry with them. I'd love to sit down and have a cup of tea with them and let them know it's okay." Satriani is currently battling Coldplay in court claiming the band ripped off his "If I Could Fly" song also on their "Viva La Vida" tune. He is seeking damages and "any and all profits" from Coldplay's popular song.